my bare cupboard: Bouchon Bakery's mini hot cross buns "
To tell you the truth I haven't had hot cross buns before I baked these . 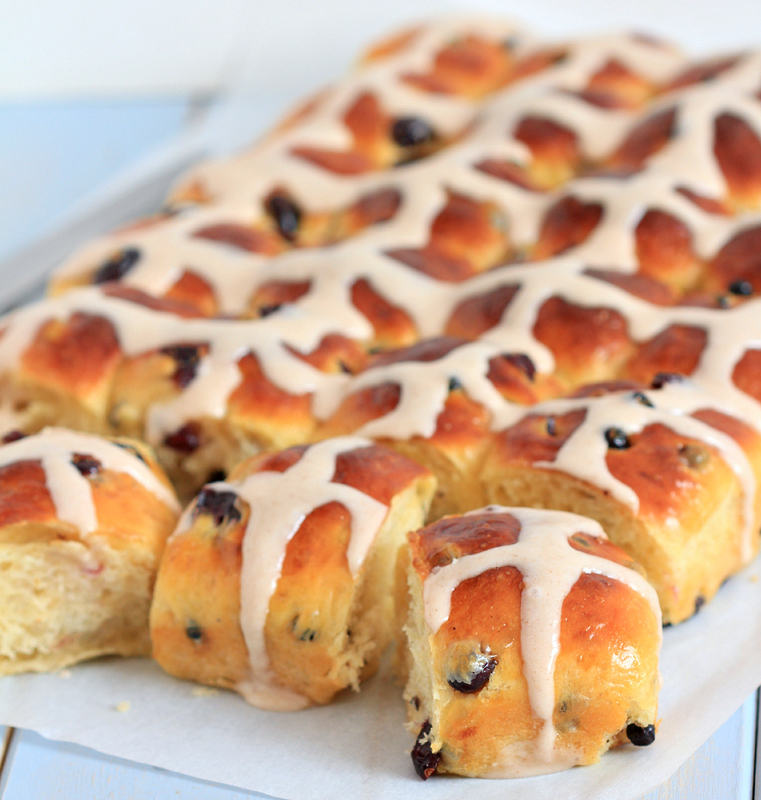 I've seen this kind of bread sold in some bakeries here during Easter but I don't have the urge to try it as it looks like a raisin roll or the cranberry loaf that I usually buy well , except for the cross icing on top . 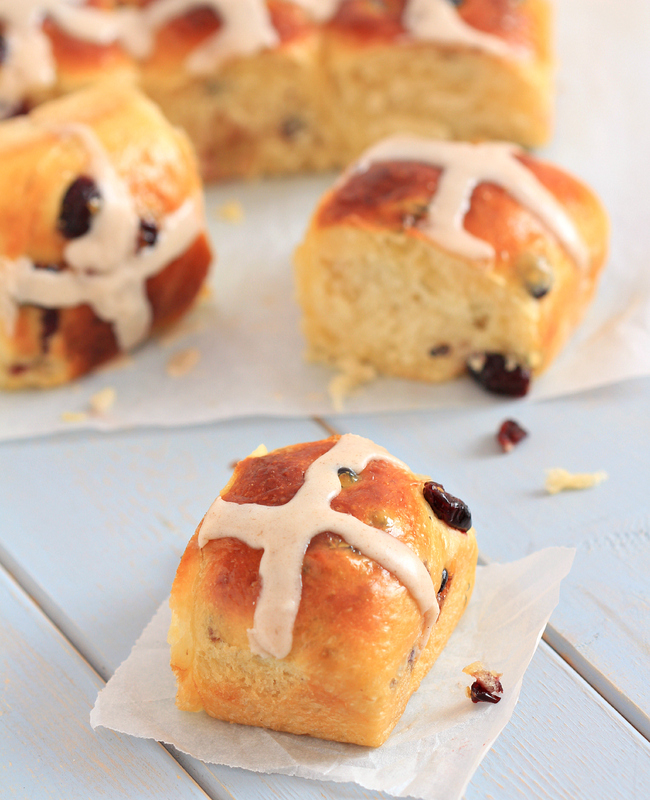 Hot cross buns are traditionally eaten during Good Friday in some parts of the world . 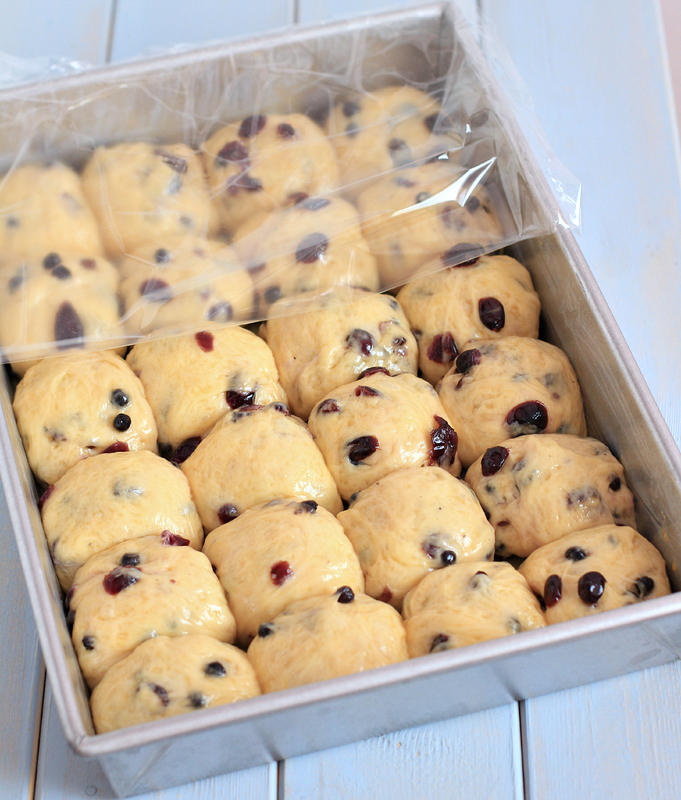 It is a spiced sweet buns made with currants or raisins and marked with a cross on top , which is made of icing . The procedure in making the dough below is by using a stand mixer but I made the brioche dough by hand . 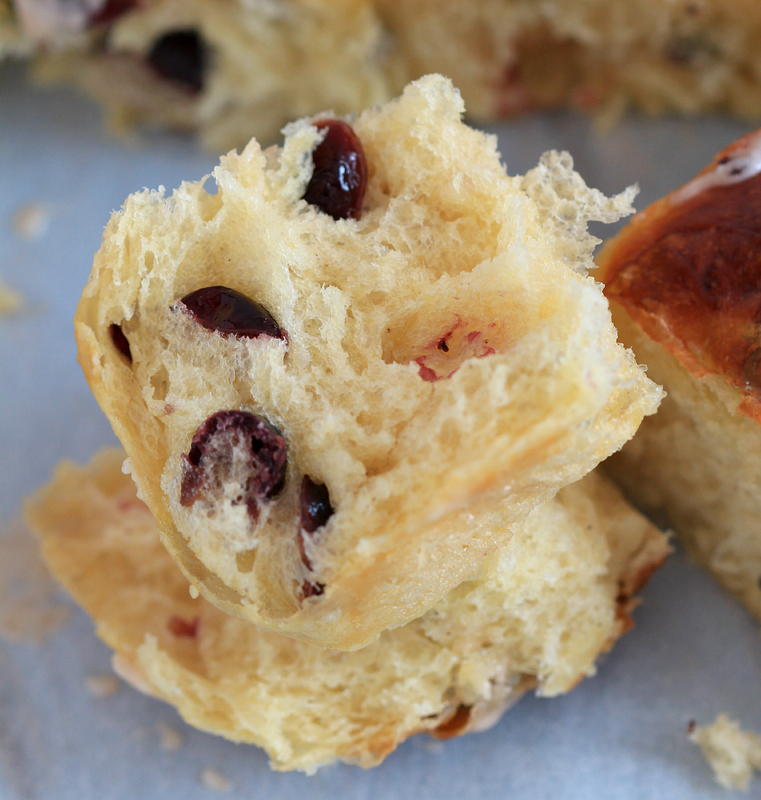 If you want to try making it manually , check this brioche post . It's not that hard to knead this brioche dough by hand , all you need is a room with an aircon and think that your arms seriously need a good workout , hey , it's almost summer here hee hee ! * Place the flour and yeast in the bowl of stand mixer fitted with dough hook and mix for few seconds to distribute the yeast evenly . Add all ingredients , except the butter , and mix on low speed for 4 minutes . Continue to mix on low speed for another 30 minutes , at this point there will be some dough sticking at the sides of the bowl . Add butter , few pieces at a time , incorporating each addition before adding the next . Stopping to scrape down the bowl and hook as needed . Continue to mix for 10 minutes . * Combine the dried fruits in a medium bowl and pour 2 cups of boiling water , let sit for 5 minutes to plump the fruits . Drain and pat dry with paper towels , transfer to a clean bowl and toss with vanilla paste , set aside . * Lightly-oil / butter a large mixing bowl , set aside . * Tip in brioche dough into a lightly-floured work surface , gently pat the dough into a rectangular shape . Pour the dried fruits mixture on top of the dough and knead together to distribute it evenly . Pat dough into rectangle again . * Stretch the left side of the dough out and fold it over two-thirds of the dough , then stretch and fold it from the right side to the opposite side , as if you're folding a letter . Repeat the process , this time from bottom and then from top . Turn dough over and use a plastic scraper to transfer the dough , seam side down into the prepared bowl , cover with plastic wrap or a clean dish towel . Let dough sit for 45 minutes at room temperature . * Repeat the stretching and folding process above , then return the dough to the bowl , seam side down , cover , and let sit for another 45 minutes . * Lightly butter a quarter-sheet pan ( 13 x 9 x 1-inch ) I used a standard 13 x 9 pan . Line the bottom with parchment paper then butter the paper . * Tip in dough into a lightly floured work surface , cut the dough into 12 equal portions at 78 grams each . My final dough is 1012 grams and each mini weighs 42 grams each ( 4 pieces are 43 grams each ) . Roll each portions into a ball until it is smooth , set balls onto the prepared pan . Brush the tops with egg wash , cover the pan and let proof for 1 to 1 1/2 hours , or until doubled in size . * Preheat over to 325°C ( convection ) or 350°C ( standard ) . Brush tops of the buns with egg wash again . * Bake for 17-22 minutes ( convection ) and 25 to 30 minutes ( standard ) , until tops are rich golden brown . Transfer pan on a wire rack and let cool completely . * Sift sugar and the spices into the bowl , mix on low speed to distribute the spices evenly . Slowly add the milk , scraping down the sides and bottom of the bowl , and beat until mixture is smooth , about 1 minute . * Transfer icing into a piping bag , snip the tip and pipe a continuous strip of icing to create a cross of frosting in each buns . Cut into individual buns and serve . Such a gorgeous bake ! I missed having these little buns. They look simply amazing. Hope you're going to have a fabulous Easter Day dear. Your buns looks fabulous! Love the golden colour! I have been meaning to make these for ages! I've just made brioche dough yesterday (Flour's recipe), and nope, no arm muscle for me! Used the stand mixer! Joyce , what person in her right mind would knead brioche dough manually if she have a stand mixer , right ?! lol Gahhhh , I want to get my hands on that Flour cookbook ! Hi Anne, your hot cross buns sure look delicious. Happy Easter! I made those buns quite often, but never topped them with icing as they are rich enough. Should bake another batch this weekend too, but for the sake of festive look, I might just drizzle a bit of icing. Yours look really super! 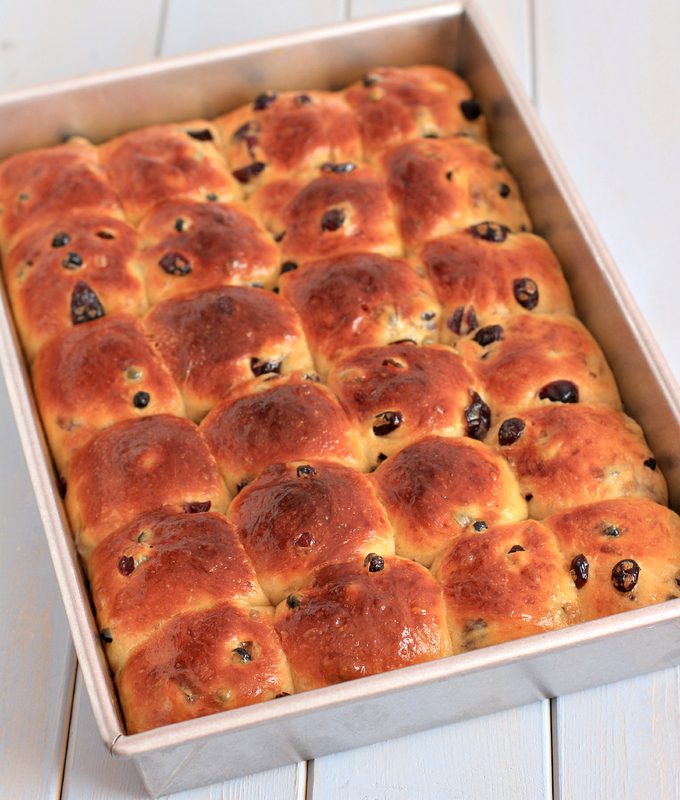 I can't believe I have never made hot cross buns! These look SO good! Anne, these are such fabulous looking buns. The nice brown crusty look so good.